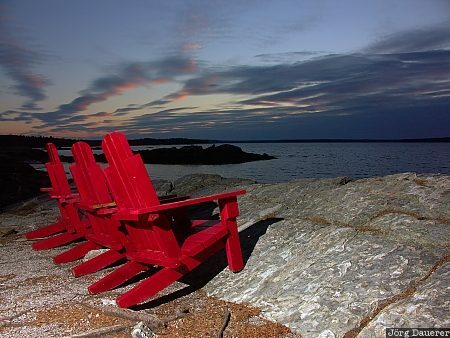 Red chairs partially illuminated by a flash gun (used as a fill flash) at Indian Point on Mount Desert Island. Mount Desert Island is in the northern part of Maine in New England in the north east of the United States. This photo was taken in the evening of a sunny day in March of 2006. This photo is part of the exhibition The color Red (June 2006). This photo was taken with a digital camera.